8/12/2011Share this story on Facebook! While students are soaking up the summer sun and completing internships, the staff at Residential Life is hard at work preparing for the upcoming semester. Over the summer, their office must complete projects like preparing training materials for all Resident Assistants, reviewing and revising the website, as well as all publications for new students, like the opening guide, packing guide, and health and safety brochure. Some staff create and revise podcasts on relevant topics like how to select campus housing, as well as work with all new students and students returning to Ithaca College to get them into a housing assignment, while also overseeing summer renovation projects in the residence halls, and providing housing for students in the summer orientation sessions. With all these summer projects, the transition into the fall semester can be a difficult one. “You start the summer thinking you have plenty of time to get everything done but it’s always a big rush at the end,” Director of Residential Life Bonnie Prunty says. Immediately after students leave in May, the team begins preparing the dorms for the following semester. Inspect each room for check-out condition. Process bills for any damages. Submit maintenance requests for items needing repair. Inspect rooms to make sure each is ready for check-in. 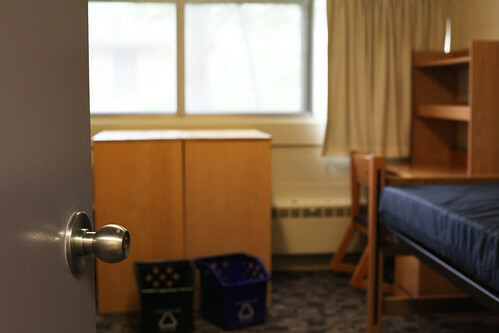 A prepared dorm room awaits students' arrival. These six steps must be completed for all 2,130 rooms on campus before the semester begins. 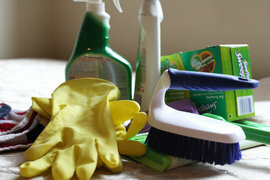 Usually, this process only needs six steps, but the staff has come upon their fair share of disastrous rooms that need a total revamp. “We have had Circle Apartments with thousands of dollars of damage that have required re-painting, re-carpeting, and replacement of all doors and couches,” Prunty explains. “We have also been challenged in years where we are using all lounges for temporary housing to figure out creative ways to cover all of the large internal windows in the lounge doors,” she says. Extensive damage or not, “it’s a continuous process and takes the entirety of the summer since we have several conferences and programs that occur,” says Sheraz Iqbal ‘12, a summer housing assistant for Residential Life. Luckily, Iqbal doesn’t mind this work. To assist with this process, the staff employs a group of students like Iqbal to assist with moving, as well as three students who work in the Residential Life office assisting with housing assignments and answering incoming calls. There are also eight students who work with the summer conference operation and one student who works in the operations area who are all involved in helping inspect rooms to make sure they are ready for opening, Prunty explains.